It's been well established that the Xbox One reveal wasn't one that went over very well with core gamers. And while there were numerous missteps along the way, Microsoft has gone to great lengths to claw their way back into (most) gamer's good graces. 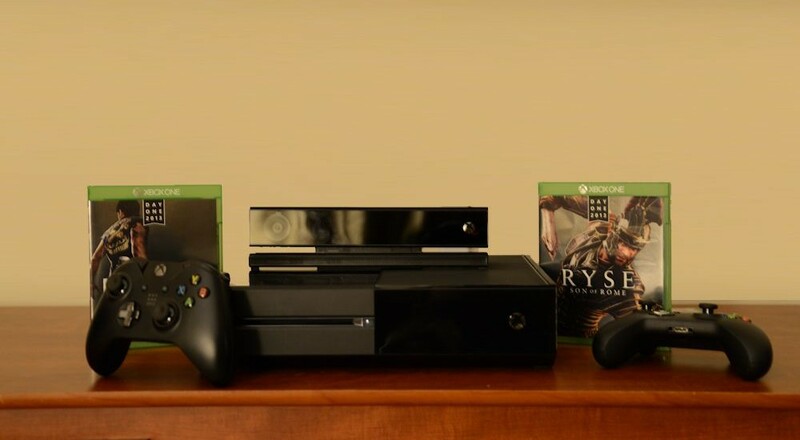 The Xbox One is out and Microsoft's vision of the future of console gaming is in many consumers hands. Is this a future we want to be a part of? We made a pretty big deal about the PlayStation 4 design, such as how its small enclosure and built-in power supply was impressive. It hides itself well within your entertainment center. The Xbox One is on the opposite end of the spectrum, in some regards, though it still blends in quite well with your existing audio and video equipment. While much was made of just how big the Xbox One is, the reality of the situation isn't so dramatic. Take the original Xbox 360 and square off the edges and you have the size of the Xbox One. Of course a large power brick adds to this and the Kinect further makes it "feel" bigger than it is. The dark aesthetics of the console with the matte and gloss finish and a simple glowing white X logo really do blend well. It's a nice looking box with plenty of ventilation - no doubt, learning from past issues. In our daily use the Xbox One remained fairly cool and quiet. Even with the drive spinning up from time to time, it's a barely audible device. If it wasn't for the visibility of the Kinect, you might forget you even have the Xbox One running. I won't dive too deep into the technical features of the box. Much has been made about the power of the console, the graphics chip specifically. Yes, the Xbox One isn't as powerful as the PlayStation 4, and it's evident by a few of the cross-platform launch titles like NBA 2k14 and Call of Duty: Ghosts - but for the most part, graphical quality is VERY close. Just as close as the previous generation between the Xbox 360 and PlayStation 3. Out of the box you have an HDMI in and out port. The in port is used to hook up your cable or satellite TV, but in reality, you could hook up your old 360 or even a PlayStation 4 and use this device through the Xbox One. There are two USB ports on the back and one port on the side, all USB 3.0. 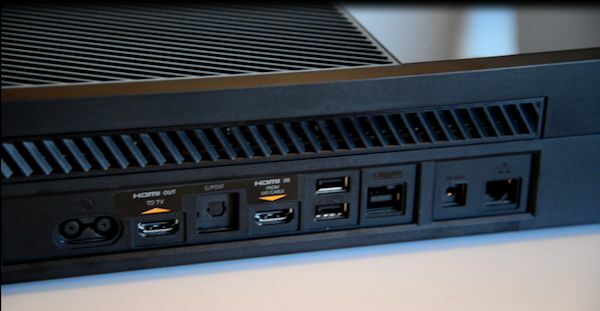 There's also connections for wired networking, the Kinect, and an IR port (which requires a cable) if your TV box is hidden from view of the Kinect. Inside you've got a blu-ray drive, Wireless 802.11a/b/g/n with 5Ghz support, and a 500GB hard drive. We feel that 500GB is simply way too small of a starting point for consoles in this digital age, especially with mandatory installs of everything. Unfortunately, unlike the PlayStation 4, the Xbox One's hard drive isn't user-upgradable. Bummer. The user interface for the Xbox One is a bit dichotomic. In a lot of regards it's a step in the right direction over the Xbox 360, but in a lot of ways, it feels like a step backwards, too. Sticking around is the familiar tile design from Windows 8 and the Xbox 360, but gone are the ads and the clutter of paging through content you don't care about. Instead, your main screen has some recent and common actions. Friends are always a click away as is the currently running app (or game in the drive). Paging to the left Microsoft has finally given us the ability to "Pin" apps and games for quick access. Paging to the right gives you access to the store with content divided up between games, movies, music and apps. I could spend pages talking about all of the redesigned applications, but let's just touch on a few. The new achievement application is beautiful, showcasing achievements not as tiny icons but gorgeous screenshots from the game. There's a clear view here of exactly what you've done, what's left to be done, and there are sections for "timed" achievements. 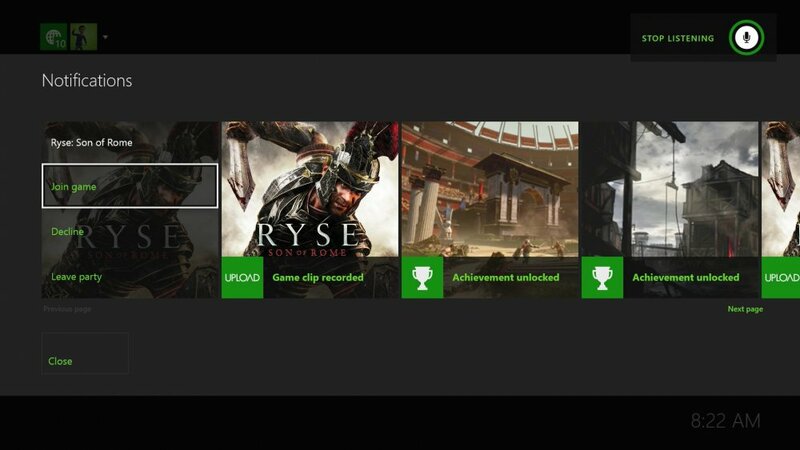 For instance, there's an achievement for beating Ryse within a week of launch or earning a million points in one week of Xbox Fitness. It's a nice addition and something to keep you coming back for more of those precious achievement points. The only issue now is, everything has achievements including the apps themselves. Watch Twitch.TV for an hour? Get an achievement. Launch Amazon Instant Video? Get an achievement. It sort of devalues what the achievements stood for and makes getting them not quite as exciting. The friends list is another area that has seen a huge overhaul. By default you get a giant social feed of what your friends are playing, what videos they uploaded, and what achievements they've unlocked. Below that, you have your actual friends list, which is now capped at 1000. There's also a list of "followers" which are essentially a one-way friends list. You can follow someone, but they don't become your friend until they follow back. Friends can then be organized into favorites for easier access as well, which is a nice touch. There are several other tweaks and enhancements to the apps on the console itself, but it should be noted that the UI is heavily geared towards voice navigation. Content is buried 2, 3 or more clicks at times. If you don't have something pinned, it's a lot quicker to simply say "Xbox, Go to Forza 5" than trying to find it by going to Apps and Games->Scroll the linear list until you hit Forza 5. We'll talk more about the voice navigation later in this review. The final piece of navigation is the ability to multitask. If you've used Windows 8 before you've seen the ability to "split" the screen between two apps. 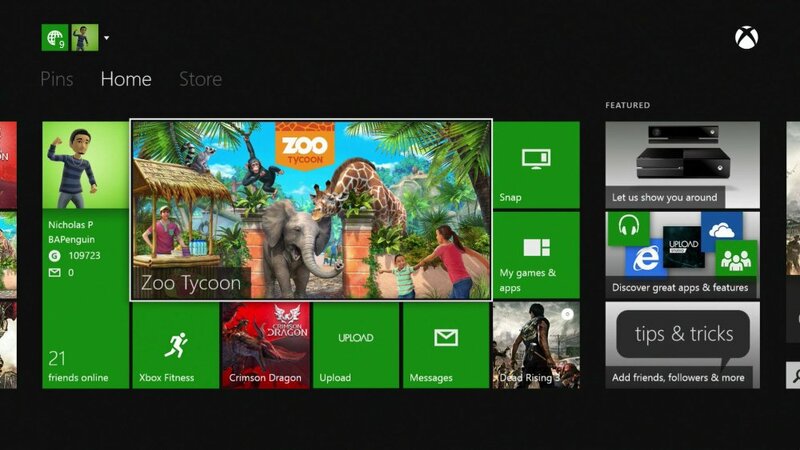 On the Xbox One you can "snap" apps to the right side of the screen. Activity streams, television, or even internet explorer can be brought up in a side view for quick reference. 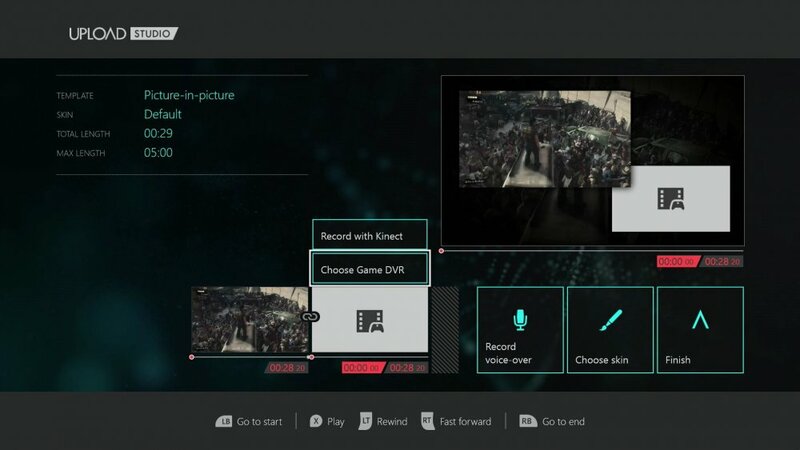 Like the PlayStation 4 there's a focus here on sharing elements, namely video. To record video you simply say "Xbox, Record That" to snag the last 30 seconds of gameplay. It'll also automatically record video at specified times during games. These clips are shared with friends automatically or you can opt to use the Upload Studio app to edit, add voice over, and more. The studio works great and it was incredibly easy to combine clips and add to them. Plus you are able to upload the raw output to your SkyDrive for YouTube uploading. Sadly there's no way to stream video right now to the internet, but that is coming next year.